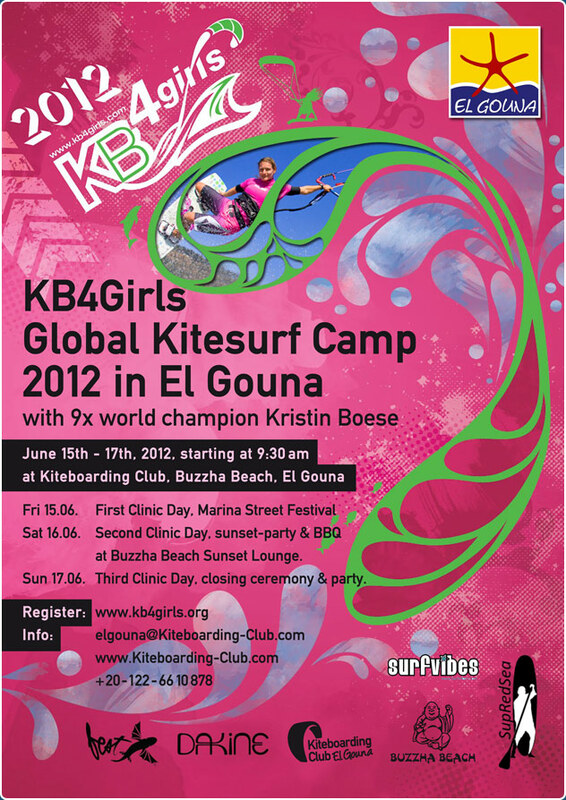 The KB4Girls Global Kitesurf Camp 2012 in El Gouna is one of the six global KB4Girls events with Kristin Boese herself this year and the ONLY one in Africa and the Middle East. The girls clinic is a great opportunity to ride and socialise with many other fellow girl kiteboarders from all over the world whilst being coached by Kristin Boese herself. Kristin is inspirational and has been instrumental in getting kitesurfing into the Olympic Games. The advanced clinic is open to female kiteboarders who can at least ride independantly in both directions and preferably upwind, although it's possible to walk upwind here in the waist deep warm blue lagoons (no wetsuits required). So far we have girls registered from new Zealand, Egypt, the UK, Israel, Poland, Germany and the USA with levels ranging from those who just want to improve their riding to those wanting to learn tricks like kiteloops and railey to blind. The detailed clinic program will be planned by Kristin in the days immediately before the clinic around the wind and tide forecast and the evening program will ensure everyone has a great time. Outside of the event days, there will be a discounted rate for participants with Surfvibes (www.surfvibes.com) for a girl downwinder to Palma Resort, which would be awesome and in the event of a no wind day after the clinic is over participants can take advantage of free snorkeling on the KBC house reef and discounted rates with SUP Red Sea (www.supredsea.com) during their stay. Aside from relaxing, there are many things to do in El Gouna, like horse riding, SUP lagoon trips, Segway tours, golf, tennis, scuba diving, a camel ride, shopping and much more. In the evenings there's always something going on in El Gouna. The town is compact so, whether on foot, by bus, tok tok, taxi or shuttle boat, getting around is cheap and easy. The head of El Gouna is totally supporting the event and has made available some incredible offers in four Hotels closest to the the event and these are extended to all comers, not just to participants, so friends and family can take advantage too. Not surprisingly the rooms are being taken up fast – so book soon to get the best possible deal. The offer covers a stay of up to 2 weeks as long as it includes the nights of 15th, 16th and 17th June. For those of you who don't know El Gouna already, it's Egypt's premier kiteboarding destination with 12km of beachfront, fringing the Red Sea and many more kilometers of interconnecting lagoons around town, it's known as the Venice of the Red Sea. It's much more than just a beach destination, it's a completely self contained, private and secure! It even has a brand new university from Berlin, international and national schools, a fantastic hospital, many restaurants to choose from, beautiful marinas and much more – in short it's unique! It is just a 35 minute taxi ride north of Hurghada Airport, which can be reached from most European countries. For registration and more information visit www.Kiteboarding-Club.com or www.KB4Girls.org.